From trial wedding styles to destination styling, we understand how important your wedding day is and will help create the perfect look for you and your entire party. Beautiful bridal looks start when you bring in your headpiece or a photo of your gown. Our bridal styles are highly personalized. As New York’s premiere extension & updo experts, we’ll customize the ideal look for you and your entire bridal party. We’ll help you plan the perfect wedding timeline, which starts with any hair color changes 6 months before your wedding, and includes the ideal times for bridal makeup trials, brow shapings, lash extensions, cut and color refreshers, and Couture Hair. With Couture Hair, any woman can have the bridal style of her dreams. 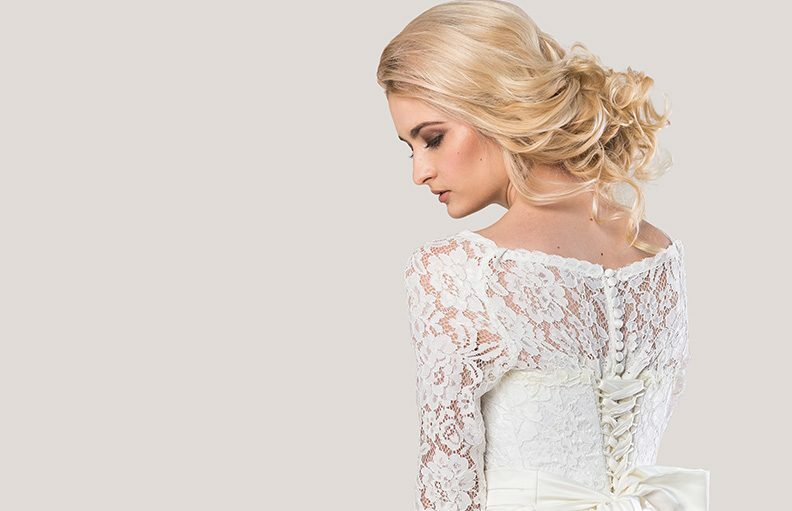 Our hair extensions and additions make any look wedding-day perfect, and are created to perfectly match and enhance your own hair. Our in-salon and destination bridal styling packages can be customized to meet your needs. Ask about: Bridal Beauty, Night on the Town, Ladies’ Play Day or our Out-of-Towner’s Experience. Packages for more than one person require a 50% deposit. Look at your gown first. If the silhouette is close/body skimming, your hair can be fuller. If the silhouette is fuller/more ball gown, your hair can be sleeker or closer to your head. The gown’s neckline also helps us determine if an updo or down ‘do is best. For instance, strapless gowns are good for half up/half down ‘dos. Angelo David Couture Hair Additions and Extensions are perfect for creating any style with volume and fullness. Look at the photos of styles you love and your hair type and texture. We can make your hair longer and fuller, or add volume in strategic areas. Most updos require a little help from hairpieces. Together, we’ll also decide if you need flat ironing or a smoothing service, or if your hair holds curls well. We’ll also see how your face shape looks with various updos. Consider your lifestyle and personality, as well as key customization. Are you having your wedding on the beach, in a chapel or in a rustic location? Are you trendy or classic? We’ll explore every aspect of your wedding that effects your bridal style. Complete your look with professional makeup. We know how to give you the flawless look that all brides want, and professional makeup is part of it. 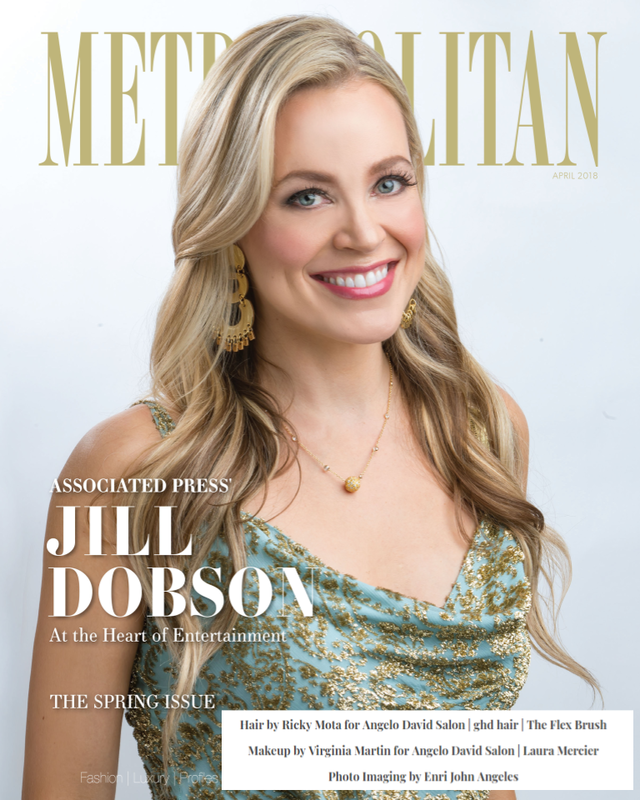 On the day you’ll have hundreds of HD photos and videos taken, our professional makeup artist will give you the fresh, dewy look that will last all day and into the night. From glowing skin to eyelash extensions, we’ll cover every base. If you are changing your haircolor, start 6 months out. By your wedding day, you’ll have had plenty of time to get used to it, adjust it, or change it. The same goes for any major hair cut. Also, start a waxing regimen. Make an appointment for your bridal hair and makeup trial. Book your Angelo David beauty team and set up appointments for your wedding party, or arrange destination styling. Credit card deposits are required for bridal parties. Experiment with faux tanners. Our makeup artist can make recommendations or show you how cosmetics can give your skin a beautiful glow. Get your brows professionally shaped; you’ll have time to grow them out in spots if needed. Reassess your haircut and style. We’ll make the subtle adjustments that will lead to the perfect look on your wedding day. Get a brow reshaping and final haircolor assessment. Also, talk to our makeup artist about lash extensions. You’ll be used to them by the big day. Get a final brow shaping. You can do this as close as two days before the wedding but not any closer if you experience redness or have sensitive skin. Consider getting nail services for the entire bridal party. The day of your wedding may not be the time to assume you’ll have the patience for polish to dry properly. Show up for your appointment a bit early if you can, so we can assess your hair. You don’t need to have it shampooed that day, but it should be clean. We will assess this during your trial styling. Sometimes, clean but second-day hair holds an updo better. BRIDAL STYLES AND UPDOSWe can create any bridal or special occasion style you want. Don’t have the perfect hair for the look? Our Couture Hair Extensions and Additions can make anything possible.Here are just a few of the looks we can create. Feel free to bring in your own photos, or show them to us on your tablet or smartphone. With Couture Hair, any woman can have the bridal style of her dreams. 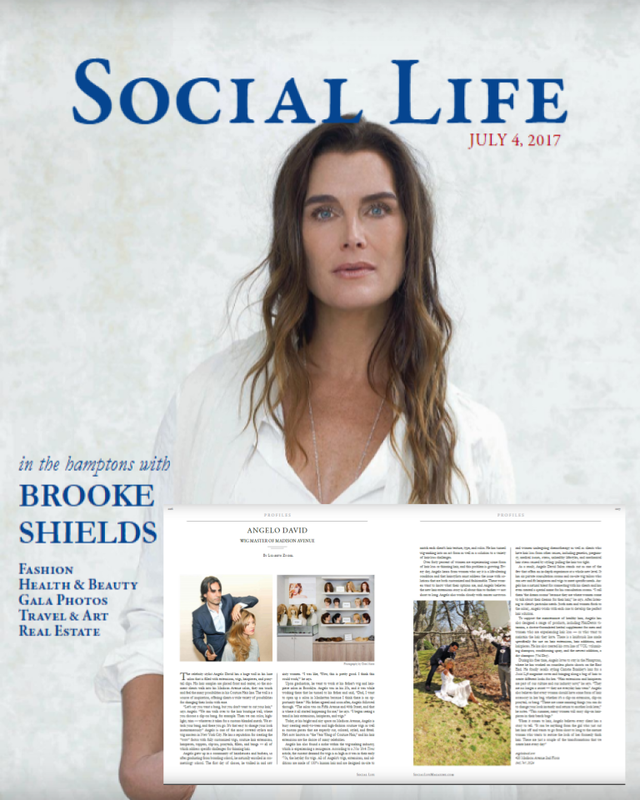 Almost all of the looks you see in magazines and on TV use hair extensions, additions or hairpieces, because they make both updos and “down” styles look fuller, thicker or longer. We can recreate your favorite look perfectly with our 100% human hair extensions and additions. 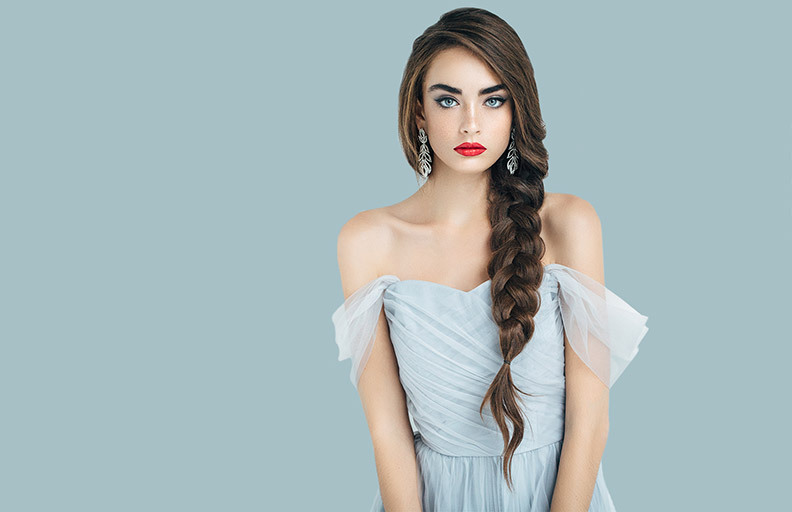 Our Couture Extensions and Additions are perfect for natural, traditional or classic looks. They’re matched perfectly to your hair type, texture and color, and we apply them seamlessly, before blending them to your own hair. Our hundreds of options will be discussed during your bridal trial styling appointment, which should be booked 3 months before your wedding. This will ensure that there’s ample time for adjustments. Our Couture Fillers can make your own hair look fuller and thicker instantly. They’re ideal for the woman who wants a natural-looking “down” style or one with soft curls. Couture Fringes give you instant bangs. If yours were cut too short or if you want bangs to soften your face or show in front of a headpiece, we’ll customize them for the perfect look. Our Couture Hairpieces and Wigs are great solutions for wedding party members, the mother of the bride and even the bride herself. 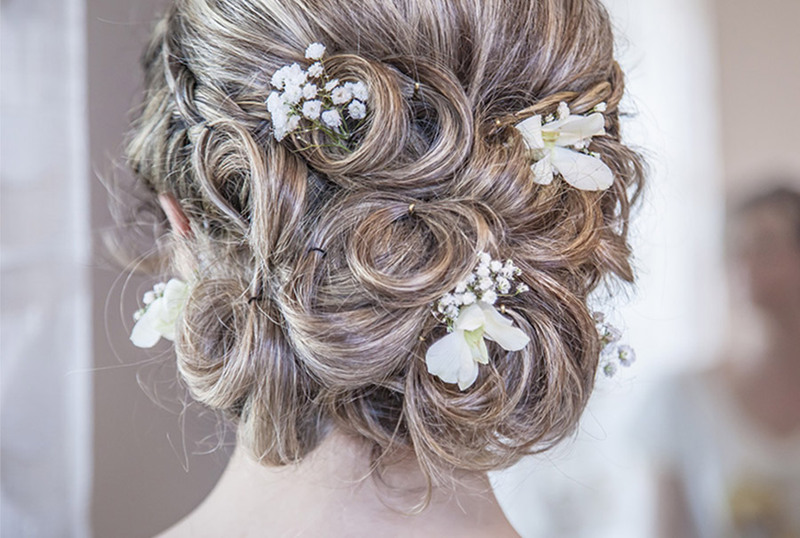 Whatever the hair challenge, we can give you and your entire bridal party a beautiful wedding-day style. Bring in any bridal style photo and you’ll be amazed at how well we can match it with Couture Hair. We offer hundreds of up, down or in-between options that are easy to have and comfortable to wear. We even offer clip-in extensions, which you can remove on your own, right after your wedding. 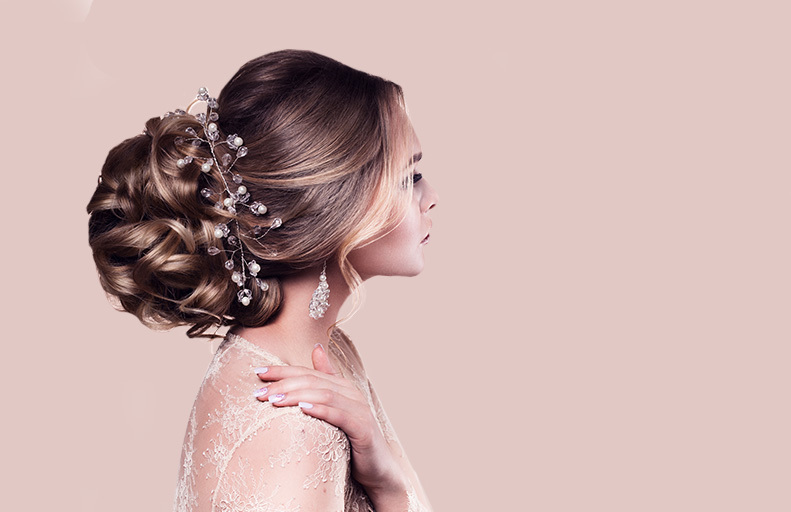 Bridal Hair and Makeup Trial: Book a bridal trial styling, during which our specialists will work with your gown, headpiece and image to develop a stunning style that fulfills your vision of wedding-day beauty. * Packages for more than one person require a 50% deposit.